I drove a historic route this morning on the way to work. Between Arlington Heights and Lexington runs part of Paul Revere’s route, where he famously rode through the countryside warning the people that the British were coming. I followed the route to Lexington Green, where stands a statue commemorating what happened next. It’s not a statue of Paul Revere. 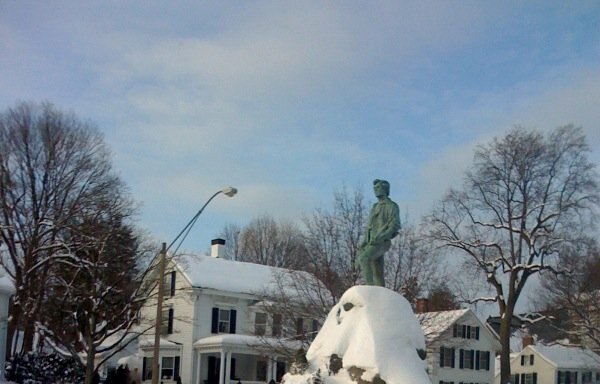 It’s a statue of an unknown minuteman, standing at the entrance to the green where the citizens of Lexington stood up to the British regulars and helped to begin our fight for the liberty to decide our own fate. It’s not just about the leader and the message, though without the right leader and the right message nothing will happen. It’s about what happens next, about individuals taking up the call and the charge and standing up to make a change. I haven’t felt much of that about our country in the last little bit, but I feel it today.